The Rolling Stones have launched their first official App as part of the band’s 50th anniversary celebrations. 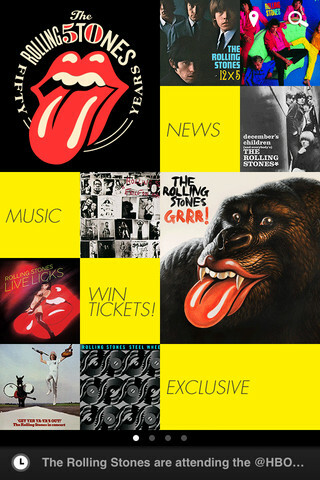 The Rolling Stones Official App will provide fans unprecedented interaction with the rock icons. Developed with the personal involvement of Mick Jagger, Keith Richards, Charlie Watts and Ronnie Wood, the app is free to download from today (some countries may take up to 24 hours to come online) and is initially exclusive to iPhone, iPad and iPod Touch. Announcements will be made soon regarding previously unreleased content, exclusive to the app; and a feature that will let fans worldwide vote for a favourite track to be played at a forthcoming gig. The Rolling Stones Official App also allows fans anywhere in the world to connect with each other and with the band themselves; preview tracks for free; listen to and buy any song from The Rolling Stones catalogue on iTunes; buy exclusive merchandise; follow tweets from the Stones; check out tour dates and check-in to tell the world ‘I was there!’ and much more. For more details and to download the Stones Official App, visit iTunes here. The Stones will perform at London’s O2 Arena on November 25 and 29, the Barclays Center in New York on December 8, and the Prudential Center in Newark, NJ on December 13 and 15.